This is the second of Splice’s albums; a collection of improvised material that melds elements of Doom Metal and electronic drones with saxophone and other instrumentation. 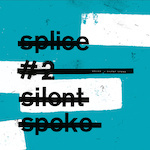 As with all music of this nature the outcome is somewhat sporadic and disjointed, but Splice do manage to hold a cohesive margin above their work as to halt everything sliding into one chaotic mess for some of the time. The percussion does meander along the Jazzier edge of musicianship, but where this would normally grate on my nerves, Splice manage to make everything gel together fairly well, with ‘Dustdevil’ holding a unique mysterious edge that fixes the listeners attention. In part, a lot of ‘Silent Spoke’ reminds me of Sunn o))) when the guitars kick in; and this for me is where Splice shine at their most brightest. The more obscure bells and whistle instrumentation does soften everything down somewhat and for my tastes does lean towards music made by forest folk; regrettably, this along with some of the more freeform clattering of disjointed noises are the main body of this double disc affair and lets everything down somewhat. Overall this is a mixed bag of an album that has some great upsides and some deeper declines; which, whilst played intentionally in the fashion they are, can become a little tiresome. This entry was posted in Dense Promotion, Loop Records. Bookmark the permalink.